The committee to draft the Declaration of Independence reviews the crucial words in this scene from the HBO series John Adams - happy 4th, folks. For birders and lovers of Victoriana and its gingerbread architecture, Cape May, New Jersey is a throwback to a more genteel time. To the north, Wildwood is also a throwback, but not to gentility; property values along the precious Atlantic coast have not knocked away this last great Jersey Shore honky-tonk outside the gutters of Atlantic City and its failed experiment with organized crime. Strangely enough for a town in a pure blue state, Cape May is below the Mason-Dixon line and seemingly carries a whiff of southern charm and manners; Wildwood sits squat upon it and has neither. Indeed, lately it as become somehow a center for Confederate regalia, according to Rich Juzwiak's blog, fourfour. Rich offers a colorful and shocking photo tour of T-shirt shops and other inspiring sights on the beach and boardwalk of Wildwood, New Jersey [hat tip: Lindsay]. The Confederate flag - known as the Battle Flag to CSA buffs and the Stars and Bars to many others - is all over Wildwood's shops and swimmers, it seems. It's simple really - tons of people don't realize that the flag represents two things above all else: black slavery and treason. They're content to wear it on their chests, tattoo it on their arms, stick it in their labels, fly it from their flagpoles, wiggle it from their asses, and emblazon it on all manner of vehicles - as if it were really a mere symbol of cultural pride, a lasting badge of honor. History is simple: a murderous gang of treasonous southern leaders turned their back on the United States of America to defend the enslavement of blacks, for economic, cultural, and racial reasons. It was a catastrophic last stand for a horrid, immoral way of life that may have died out in another short generation because of growing distates for shackles and whip throughout the western world. The flag was the symbol of the armed rebellion against the very idea of America. It is an icon of the greatest act of treason in our history - an icon made worse by the constant attempts at its resurrection as a legitimate cultural symbol after Reconstruction. I live in Virginia. I have always had friends from various ethnic backgrounds, grew up listening to hip-hop, and attended a predominately/historically black college. I'm not at all religious and believe in the equitable treatment of people from all races, belief systems, and sexual lifestyles. I also hold the Confederacy dear to my heart. The basic idea of freedom has been altered since the Union won the Civil War, to the point where there is basically no real choice left in America. When people bemoan the two-party system and the choice between two evils that they're forced to make every four years, they ought to understand that it began when the C.S.A. was defeated. It's unfortunate that the source of the conflict was slavery, because it clouds the issues of personal freedom and of the rights of the States. Slavery is indefensible, but this country was founded with an allowance for the freedom of each individual State, and that war destroyed this freedom and led to the death of many others. I am black and the proudest of southerners. The Confederate flag is not patently offensive. What is more, perhaps many northerners should get off their high horse about blacks, slavery, the flag, and the south. The north has it own problems, including racism. I have friends that have the so-called Confederate flag, and they are not racist. As to this topic, it seems northerners lack the ability to comprehend the naunces of love for the South, it culture, long dead family members that fought in the lost cause, while not necessarily hating blacks or loving slavery. It is more than just bumpersticker logic to say that one can be proud of the south, as I am, without being a racist. I am proud of Martin Luther King, but I am also proud of Robert E. Lee, as he was an honorable gentleman, solider, Christian, and educator. We all make mistakes. We all do indeed make mistakes, but symbols of those mistakes can be very powerful and incredibly offensive. In a land where we attempt to amend the Constitution to prevent the burning of our national symbol, and where mainstream commentators accuse newspapers of treason for reporting accurately on secret government programs, symbols do matter in daily life. 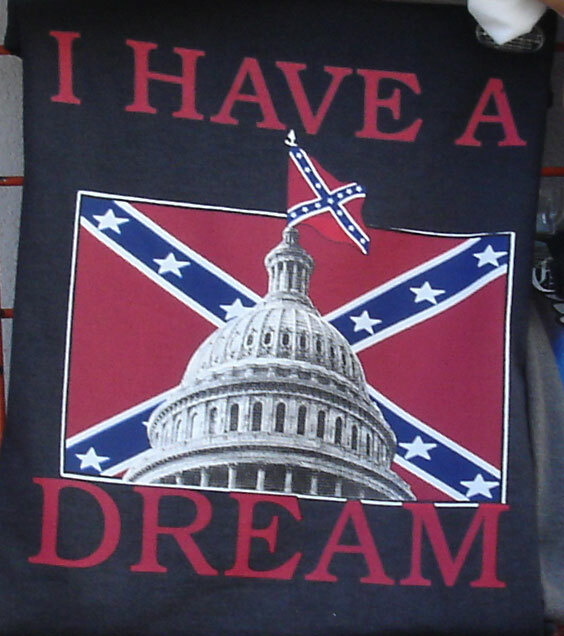 And while arguing over the causes of the Civil War in the context of boardwalk T-shirt shacks seems silly, arguing over the symbol adopted by Klansmen to terrorize Southern blacks within many of our lifetimes does not. Besides, the flag-burning amendment folks have one thing right - if you're an American, there's only one flag. My friend Brendan - who runs the Hell Yeah! blog - is always telling me that a big portion of the right's motivation for the disastrous adventure in Iraq is business: and not just keeping the world safe for capitalism, either. Direct business. Big business. In short, profiteering. Brendan argues that while Marines face trial for murder after more than three years of sitting duck duty, while the death toll nears 2,500, while insurgency melds into anarchy, the cash registers ring. Ironically, we intersect with another statement from the former president. Truman dubbed the 1948 Congress as the "Do-Nothing Congress" because they were in session for only 108 days. But I think the current collection of suits has them beat with only 97 days in session. It’s the "Do-Less-Than-Nothing" Congress and while they chase 12 million undocumented workers all over the country in the House and go off on gay-bashing tirades on the Senate floor, they are ignoring a major issue - war profiteering. evidence and were repelled by it." To their credit the director and his screenwriter, Akiva Goldsman (who collaborated with Mr. Howard on "Cinderella Man" and "A Beautiful Mind"), have streamlined Mr. Brown's story and refrained from trying to capture his, um, prose style. "Almost inconceivably, the gun into which she was now staring was clutched in the pale hand of an enormous albino with long white hair." Such language — note the exquisite "almost" and the fastidious tucking of the "which" after the preposition — can live only on the page. The hilarious "controversy" over the Code's alleged attack on the Church just sells tickets, to a movie that almost by definition has to be better than a dreadful book (I mean, can Hanks and Ron Howard fail to create a not unpleasant two hours)? As the Sawpit says: no one has a monopoly on Jesus. And as Gandalf, er, Ian McKellen told The Today Show this morning: how come there's no disclaimer in the front of the Bible? Different stories, different people, different truths. Or to quote Variety: Catholic League Ballistic. Ticket Sales Soar. Book, meanwhile, remains a poorly-written, fact-challenged bit of fluffery. So tonight there's Chris Matthews doing HardBall live from the Lexington Avenue headquarters of Opus Dei, doing his best Larry King imitation - "So Father, the Pope, great man, dead yesterday, already on his way to heaven? Or already there?" As President Bush's approval ratings continue to slide, the chattering conventions adopt resolutions comparing his slipping numbers with the lowest of the low: the ultimate Mendoza-line President, Richard Nixon. But right-leaning observers - those who are disgusted by Bush's failure but loyal to their politics - raise another colossal Oval Office flop time and again, when publicly wringing their hands about the slow destruction of their beloved party. George W. Bush, they'll tell you, is getting perilously close to Jimmy Carter territory. For all the easy list comparisons of failure and malaise, Jimmy Carter is acres of fertile territory past George W. Bush as President of the U.S. It's not close, just on the basis of Carter's permanent introduction of human rights as an important factor in American foreign policy. Sure, there was the sweater, Iran hostages, oil prices, the stupid Olympic boycott - a litany of disasters, no doubt, and not easily balanced by Camp David, the Carter Doctrine of an open Persian Gulf, and his dual stance of Salt II with a human rights stick for the USSR. Still and all it's a much shorter list, with fewer dead bodies, than Bush's - and human rights trumps all, in my book. (As does a post-Presidency career of a truly great man- and a burr in the saddle of every President after him). Even Reagan continued that human rights doctrine (on a very selective basis - along with every President after him - but it became part of the national debate permanently). So yeah, don't lift Bush by comparing him with Jimmy - he wilts in the side-by-side.